Yes please, give me MORE! One of the best changes I have EVER made in my life is how I deal with getting the good stuff. You know, those little or big things that we are gifted with like new clients booking in, getting a free coffee, finding exactly what you need on sale, all those gorgeous things that feel good and abundant and lucky and blessed. In the past, when something good happened to me, there was a part of me that was waiting for the other shoe to drop. In the past, I had a belief that good things just didn’t happen to me. I was never in the right place at the right time, overlooked, unlucky, didn’t even dare to dream or want anything much at all. So when something wonderful happened to me, it felt totally random. So rather than glory in the goodness and the happiness of the event, whatever it happened to be, I allowed myself to enjoy it for a little while, but then cast a very suspicious eye in the direction of fate, wanting to be prepared for when my life would return to it’s normal and usually negative way of being. I am SO glad those days are gone! More JUICY, WONDERFUL, HAPPY GOODNESS! Thank you and please, GIVE ME MORE! When I started doing this, when I shifted my focus, when I appreciated and acknowledged what I got and asked for more, something very strange happened. 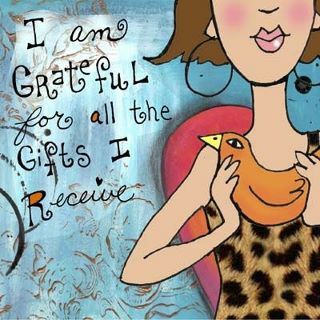 I changed my focus to what I HAVE now, to building my capacity for joy and gratitude and abundance and trust. Trust that what I need I will receive. Trust that I do DESERVE good things. I changed my concept of myself from “unlucky” to LUCKY and BLESSED and HAPPY. So, what is YOUR current motto in life? Do you prepare for the worst or expect the best or are you somewhere in between? How would your life change if you dared to ask for more? More of the good stuff! This entry was posted in Uncategorized and tagged Abundance, deserving, luck by dietfreebody. Bookmark the permalink. It’s me for the second round! Kerry, this was a lovely post because it made me think that I need to vocalize my desires more out loud! I listen to my desires, I feel them, I give them life, but I think I could bring much more in if I spoke then aloud more. I tend to store them within me and just get to work. I’m going to change it up and test this out. I’m so glad you crossed over from how you used to believe/think and feel to now know truly that you deserve the best, and you are blessed. SO glad you liked it. There is such power is saying it out loud. Let me know how it works for you! Kerry – love this “arms open to the universe” approach. I know there have been times I’ve been waiting for the other shoe to drop instead of enjoying what I have. Working on asking for more of the good stuff!